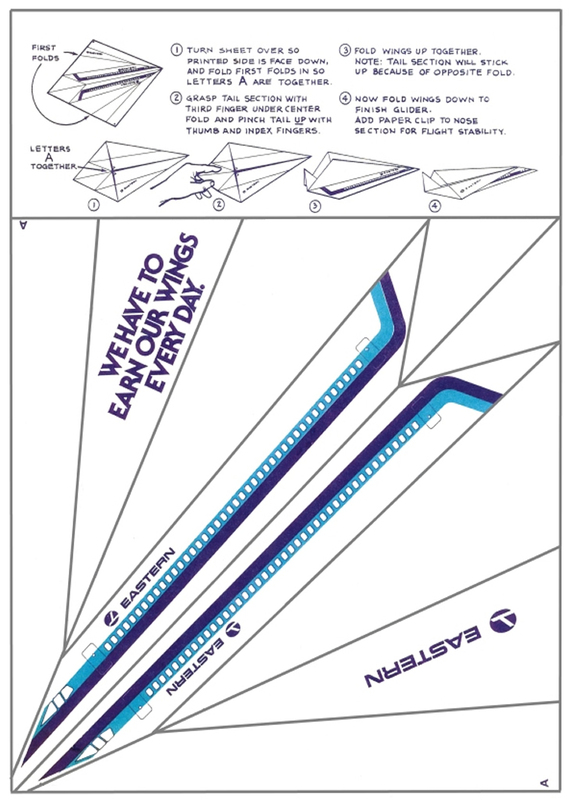 Eastern Air Lines began life on April 19, 1926 as Pitcairn Aviation. Pitcairn won a government contract to fly mail and operated Mailwing single-engine aircraft to fly the US Mail between New York and Atlanta. In 1929 Clement Keys, the owner of North American Aviation, purchased Pitcairn, and in 1930 he changed the name to Eastern Air Transport, and would soon be known as Eastern Airlines. In 1938, the airline would be purchased by World War I flying ace, Eddie Rickenbacker. Rickenbacker pushed Eastern into a period of prodigious growth. Throughout the 1940s, competitors were acquired, more advanced planes were purchased and international routes were opened. By the 1950s, Eastern's propellers were very prominent up and down the East coast of the United States. In 1960 Eastern's first jets, Douglas DC-8s arrived, allowing Eastern to open non-stop service from New York City 's Idlewild International Airport to Los Angeles, California. 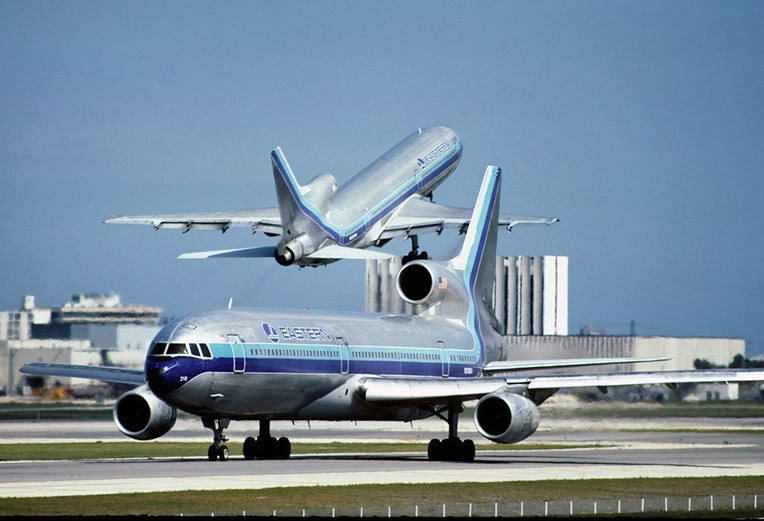 The DC-8s were joined in 1962 by a brand new sister, the Boeing 727. 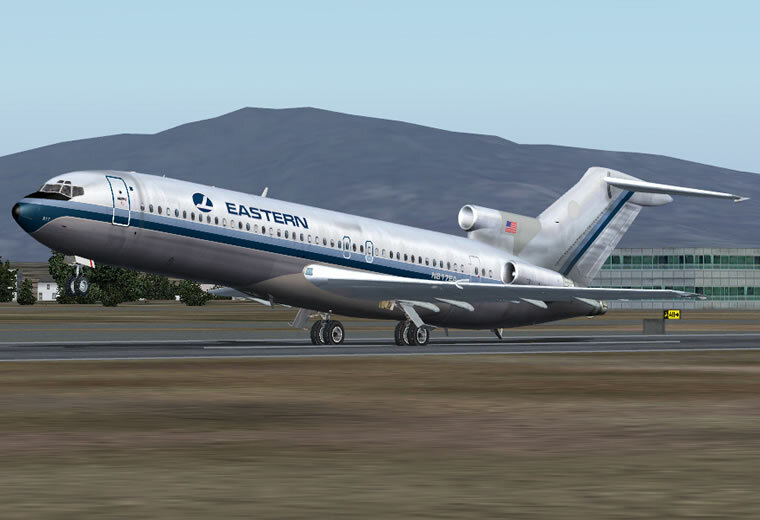 Around this time, Eastern started changing their plane's livery colors to include the dark blue hockey stick design that is now famous in the airline industry. 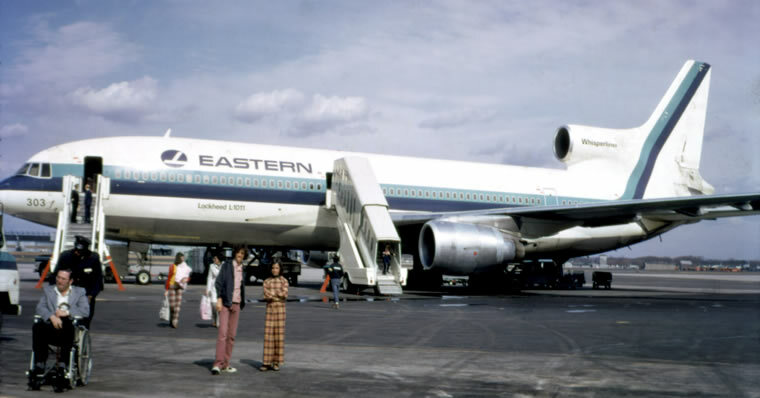 The 1970s brought dramatic changes in the configuration of Eastern Airlines. Internationalization was begun, and Eastern opened routes to new markets such as Madrid, Mexico City, Santo Domingo, Nassau and London. 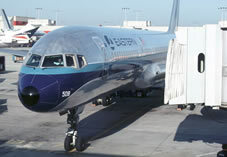 Services from San Juan 's Luis Munoz Marin International Airport were expanded, and Eastern bought the Lockheed L-1011 jet, which would become known in the Caribbean as El Grandote (the huge one). Boeing 747s were also introduced for a short time during that period, and Eastern became the official airline of Walt Disney World. Eastern's official ride at Disney's Magic Kingdom park was If You Had Wings. 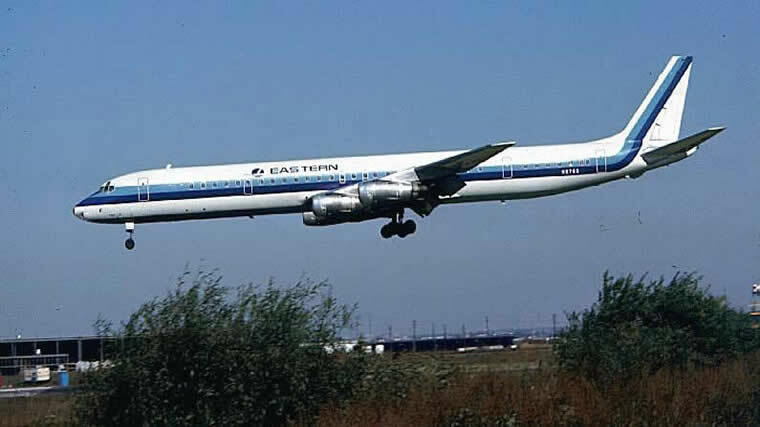 During the 1970s, Eastern Airlines flights suffered several crashes, one of which became a subject for a Hollywood movie. 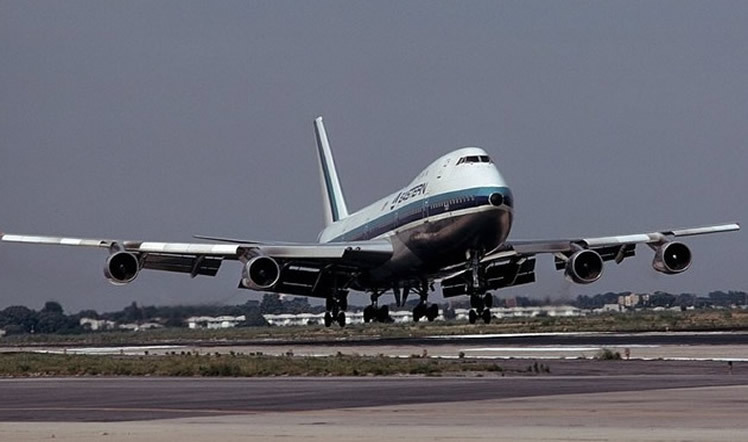 Eastern Airlines Flight 401 was preparing to land in Miami, Florida in 1972, when the pilots became distracted by a non-functioning gear light. While pre-occupied with fixing the light, the autopilot was inadvertently disengaged, allowing the plane to drift far below its' planned flight path. The flight crashed in the Everglades, near the same site of the ValuJet Flight 592 DC-9 crash 23 years later. In Eastern's flight 401 case, it was rumored that the ghost of the pilot who flew that night was later seen on some Eastern planes that carried parts of the doomed plane. While this was largely an unproven legend, it was the subject of the movie The Ghost Of Flight 401. The airline deregulation law of 1978 aggravated its position, forcing Eastern into a competitive low-fare environment in which its high cost of operation put the airline at a decided disadvantage. Its all-important Atlanta hub placed it in direct competition with Delta Air Lines, a more profitable company that avoided labor wars and built a far-reaching route system through the acquisition of other carriers. Eastern was rolling along when the 1980s started, under its new president, former astronaut Frank Borman. In 1980, a Caribbean hub was inaugurated at San Juan (then still named Isla Verde International Airport). In 1982, Eastern acquired the Braniff International 's South American route network. And while this all was going on, Eastern enjoyed splitting their fleet between their "silver colored hockey stick" livery (the lack of paint reduced weight by a hundred pounds) and their "white colored hockey stick" livery (on its Airbus-manufactured planes, whose metalurgy required paint). In 1983, Eastern became the launch customer of Boeing 's new aircraft, the Boeing 757. It would become an invaluable asset to the airline until its later days. In that same year, Eastern re-introduced services to Ponce, Puerto Rico, using Fairchild Swearinger planes under the name Eastern Metro Express. The Eastern Metro Express operation wasn't limited to Ponce, however, as, under that name, Eastern began services from its San Juan hub to Mayaguez and several other smaller Caribbean communities, from New York's JFK International Airport to several northeastern cities, and from Miami to many cities around the South. Eastern began losing money as it faced competition from no-frills airlines, such as People Express, which offered drastically reduced fares. In an attempt to differentiate itself from its bargain competitors, Eastern began a marketing campaign stressing its quality of service and its rank of highly experienced pilots. The public, however, just wanted cheap fares. Unable to keep up, in 1986, Borman sold the airline to Frank Lorenzo. Under Lorenzo's tenure, Eastern was crippled by severe labor unrest. Asked to accept deep cuts in benefits, Eastern's machinists striked. Lorenzo sold Eastern's shuttle service to real estate magnate Donald Trump in 1989. The machinists were soon joined on the picket line by the pilots. Due to the strike, flights were cancelled, resulting in lost revenue for the airline. As a result of the strike and other financial problems, Eastern filed for bankruptcy protection on March 9. The coup de grace for Eastern, it can be said, was the 1990 Gulf War. At a nice profit, Eastern sold its Central and South American route network to American Airlines and its transatlantic route network to Continental Airlines. 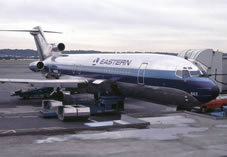 With the higher oil prices and the public's fear of flying at the time, Eastern's sales kept suffering, and Eastern had their last flight in January 1991, officially shutting down on January 18. Lorenzo had suffered the same luck he suffered as chairman of the board in his previous airline company, Texas International.